Contractor Jobsite Trailer Ideas | 41 Lumber - Serving Iron Mountain and the U.P. Having the right tool for the job can make all the difference in the world -- especially in the contracting business. Furthermore, having the right place to store and use your tools at the jobsite can do wonders for efficiency. Customized jobsite trailers are nothing new. There are companies devoted to designing and selling them. Truth is though, nobody understands the way that you do your job better than you. That’s why adding a few tweaks and customizations to your jobsite trailer can make a huge difference in the way that you are able to complete your projects on time. Depending on the type of work that you specialize in, an enclosed jobsite trailer can just be a means to store your most commonly used tools and/or a way to haul materials to the jobsite. However, some jobsite trailers are designed to be a veritable workshop on wheels. Imagine having exactly the tools you need, already on the workbench and in the cabinets of your trailer? No need to constantly go over a list of all the things you’ll need to bring with you to the jobsite, on any given day. In addition, if you have a work bench in your trailer, you and the materials will be protected from inclement weather. Work can be performed without hauling cumbersome tools into the customer’s home and there’ll be potentially less cleanup at the end of the day. Consider power. Storing a small generator in the trailer is one option, but installing a marine battery within the trailer itself may be all you need. With a power inverter installed, you’ll be able to have lights working overhead and a couple of outlets to run power tools and maintain chargers for your cordless tools. In addition, the marine battery can charge while the vehicle is running. Install an air compressor. Run piping to allow for quick access from the inside and the outside of the trailer. As mentioned above, a worktable can be infinitely useful. Install cabinets below for handy storage. For additional storage, consider using small drawers in place of the toe kicks under the cabinets. Instead of just using plain-faced cabinets, consider using a variety of wood species for your cabinets and drawers so that you will have examples to show customers. 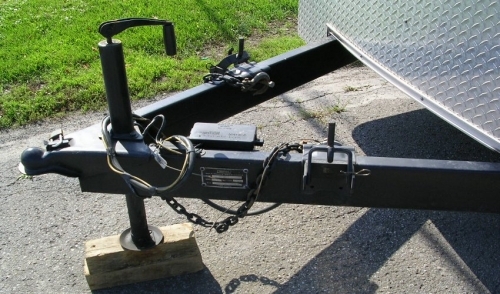 As you consider the layout for your jobsite trailer, remember to try and keep the heavier items over the axles. A ramp can be a matter of preference. If you find yourself delivering cabinets and such things often, then a ramp probably would be more useful. For some though, the ramps may take up too much space when opened, since driveways are only so big. A rollout canopy on one side of the trailer can make a big difference in the hot sun or during a rain shower. Just like your garage or workshop at home, security is important. Make sure that you have adequate locks or even alarms on your trailer. Some customized jobsite trailers even have heat, ventilation and vacuum systems. If the trailer will be unheated, consider keeping items susceptible to freezing, such as caulk in an insulated box. A protected light bulb installed in the box can help keep the temperature above freezing. Don’t forget about the outside. Spend the extra money on lettering and graphic design, so that your trailer can also be your traveling billboard.